For other films related with Aladdin, see Aladdin § Films. Aladin is a 2009 Indian Hindi fantasy action-adventure film directed by Sujoy Ghosh. The film stars Ritesh Deshmukh, Amitabh Bachchan, Jacqueline Fernandez and Sanjay Dutt. The film received mixed reviews from critics and performed poorly at the box office. Long ago, Ringmaster (Sanjay Dutt) was once a genie, but he used his powers only for himself, not to grant wishes to humans, so the other genies decided to strip him of his powers. He was still immortal, however, and still possessed great strength and knowledge. He vowed to regain his powers someday and get his revenge. Kasim has a strange fixation on Aladin and constantly teases him about his name, bringing him oil lamps, forcing him to rub them, and taunting him when no genie appears. He has always done this, ever since he and Aladin were both children. Aladin's grandfather taught him a magic trick: he can put a small object in his hand, close it, say the magic words "Tak Dhina Dhin," and open his hand to reveal a different small object. It is not real magic; he's secretly transferred the object to his other hand. It is entertaining, though, and sometimes useful. Genies have certain rules they must abide by. First of all, there is the well-known three wishes rule: whoever rubs the genie's lamp and summons the genie gets three wishes. Also, a genie may not harm anyone who possesses either their lamp or any part of it --- this protects Ringmaster, because he still has the piece that broke off Genius's lamp. If a genie refuses to grant a wish, he loses his powers and becomes mortal. There is also some sort of code of ethics that genies must abide by, stating that genies must use their powers to grant wishes to humans and not use them selfishly—this is not a magical rule like the others, but it is enforced by genie society. It is possible for genies to band together and take away a misbehaving genie's powers. It is unstated how many genies there are in existence and how many of them are free to do as they please, or whether they are mostly confined to lamps. There is a magical mirror that genies can use to obtain information and answer questions they have. It can be broken, but if its pieces are reassembled, it returns to its original flawless shape. A human had just found and reassembled the mirror when Ringmaster and his gang killed him and stole it. There appears to be a magical comet that approaches Earth once every million years. Its magic can restore an ex-genie's power, although what else it may be able to do is unknown. Ringmaster originally plans to wish for Genius to transport him to the comet, but after Genius also loses his powers, Ringmaster changes his plan, because he knows that the comet's reflection will work just as well. Aladin handles the comet's reflection only briefly, but it seems to have granted him some sort of magic power as well, although the extent of this power is unclear. Genius turns Aladin's guitar into a colorful frog that makes guitar-like sounds; it remains a frog for the rest of the film. The film opens with the family of archeologist Arun Chatterjee, who lives with his wife, Riya, and baby son, Aladin. When out on a holiday, Arun is attacked by a gang searching for a magic lamp, which Chatterjee has found, but has hidden somewhere. Arun and Riya Chatterjee are murdered; Aladin is raised by his grandfather. After his granddad's death, a now grown-up Aladin Chatterjee (Ritesh Deshmukh) lives in the fictional city of Khwaish(wish). He is lonely, and Kasim (Sahil Khan) and his gang members have bullied Aladin since his childhood. His life changes when Jasmine (Jacqueline Fernandez) enters the city, and Aladin immediately falls for her. Jasmine has a birthday party for Aladin, and as a present Kasim gives Aladin a magic lamp for his birthday to embarrass him in front of Jasmine. However, this lamp turns out to be the magic lamp that Aladin's father's murderers were trying to find. 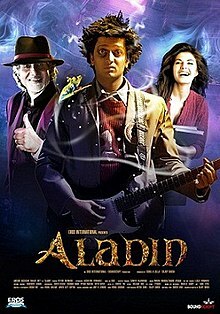 Aladin rubs the lamp and releases the genie, Genius (Amitabh Bachchan). Desperate to grant him three wishes so his contract with the magic lamp can end, the rock-star Genius suddenly makes Aladin's life very interesting but chaotic. Aladin does not want to make any wishes, but Genius enters Aladin's dreams and finds out what he wants, getting his sleeping mind to make a wish: to make Jasmine fall in love with him. When he wakes up, he does not like what Genius has done and uses his second wish to return Jasmine to normal. His third wish is for Genius to help him woo Jasmine without using magic to make it happen. Genius does his best, but magic is really his strong suit. Still, as a result of Genius's help/interference, Aladin stands up to Kasim and starts a relationship with Jasmine, and Genius teaches Kasim a lesson. Aladin's future looks perfect, until the real threat looms on the horizon - the ex-genie, Ringmaster (Sanjay Dutt). Ringmaster is searching for the magic lamp and kidnaps Jasmine with the help of his circus gang. Shortly after Genius and Aladin realize she has been kidnapped, an informer (really Ringmaster in disguise) tells Aladin that it was Genius who murdered his parents. Aladin insults Genius and tells him to leave. Heartbroken, Genius goes to rescue Jasmine alone. As he arrives, it is revealed that Ringmaster is the one who actually killed Aladin's family, as he has been searching for the magic lamp for a long time; Aladin's parents found it first, and Ringmaster punished them for it. Ringmaster steals the magic lamp and wishes for Genius to kill Aladin, but Genius refuses to do it, and loses his magic because he did not grant the wish, just as Ringmaster had planned. Aladin learns that Genius is innocent and arrives to help him, and they succeed in rescuing Jasmine. Ringmaster's plan is then completely revealed: he plans to perform a ritual to steal the reflection of an approaching comet, getting back his genie powers as a result. Genius, Aladdin and Jasmine intervene, and Aladdin steals the comet's reflection, giving genie powers back to Genius instead of Ringmaster. Genius seals Ringmaster inside a mirror and then shatters it, defeating him. The Ringmaster's gang is also defeated. In the end, the trio happily gets back to the city, Aladin and Jasmine are a couple, and after earning special superpowers from the comet, Aladin gives Kasim yet another lesson. Music of film is composed by Vishal Shekhar,lyrics penned by Vishal Dadlani and Anvita Dutt Guptan(Bachke O Bachke). Zoom TV gave the film 2.5/5, stating "Aladin fails to enchant". They have also criticized that Jacqueline has been put in the cast for the sake of an actress and she has not got much to do. However, according to the scale 2.5/5 is an average. Amitabh Bachchan was praised for his performance as "Genius." Entertainment Daily has given the verdict saying that "Aladin is surely a let down." Nonetheless they have praised the special-effects used in the film. Noyon Jyoti Parasara from AOL India praised the SFX but also pointed out, "Despite a good enough story to carry the film ahead, Aladin falls due to blunders in screenplay. Attempts to rush up things and add entertainment make the story go haywire." He rated the film 2 out of 5. Rajeev Masand of IBN Live gave the film 3 stars and noticed the movie bought fable to life. Aladin did not perform well at the box office either. Its lifetime gross was 135 million with the budget not being recovered. ^ a b "Aladin Box office verdict : Disaster". Indicine. Retrieved 21 August 2018. ^ "Aladin - Movie". Box Office India. Retrieved 21 August 2018. ^ "London Dreams, Aladin bomb at the BO". hindustantimes.com. Retrieved 25 June 2016. ^ "IIFA Awards 2010 announces Technical Award winners - bollywood news : glamsham.com". www.glamsham.com.